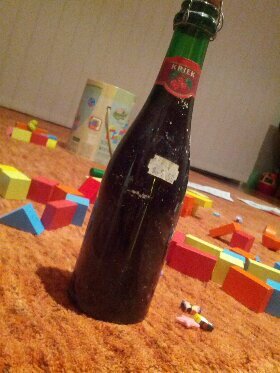 This BelleVue Kriek was one of a few beers I was very keen to try when I did that pilfering of my mum and dad’s coolroom. Like the others, I knew it was an old beer because it had been sitting way up the back of the coolroom. I also knew it was old because, as you can see, the label’s come off. But precisely how old it is, I can’t tell because there are no bottling dates or best before dates that I can see on the bottle. There is a price tag on the bottle, which you can see in the picture, and it reads $5.50. I thought that might have helped work out the age but a quick look online and I found that this beer goes for about $6 today. Which doesn’t help much. So lets just say it’s about a decade old, okay?Despite being stored upright, the cork in the bottle hasn’t dried out and let out any beer – or let in any oxygen either. That’s a bit impressive. The beer pours like a watery red, less crimson-coloured than I recall from the fresher versions. The aromas of cherries are still there but have faded – and there’s a hint of alcohol on the nose too. On the tongue, it tastes a bit watery but it’s very definitely still a cherry beer, though the tartness doesn’t seem to be there so much. All-up I’m quite pleasantly surprised at how well this beer has held up.